Your website is a virtual window into your business and has a significant impact on how your customer perceives your products or services. It gets imperative for businesses to work on the minutest details and achieve perfect results for offering only the best web experience to your customers. This can be achieved by having an up-to-date, maintained website that ensures seamless customer experience, maximum security, and better results for your online marketing strategy. It’s important to understand that a one-time technical glitch can prove to be immensely costly to your reputation, not to mention putting your website at the risk of virus attacks. If you have availed web maintenance services, you can reap the benefits of latest technical updates that help to increase the web experience of your users by several notches. It is quite likely that your provider will constantly be working on improving and adding new features that enhance your user experience. A well-maintained website helps promote your brand, work, and mission. As malware attacks get more advanced day by day, hackers remain on the prowl to exploit your website weakness for their immoral purposes. If your website is not updated to the latest version, the hackers can become successful in breaking into your system, and put your business security at risk. Thus, you need website maintenance services to keep your website safe from viruses, trojans, hackers, and other malicious programs. Your website maintenance partner would keep updating requisite anti-virus properties to keep your website running safe and sound. 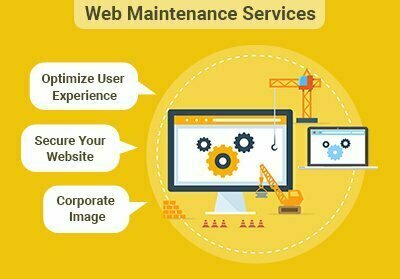 If you opt for website maintenance service, your business can seek a timely solution for pressing needs. You no longer need to hire an outside expert each time you face an issue, unexpected glitch or a bug that you may notice. A poorly maintained website with several broken links, errors, dated pages, and outdated information projects a poor professional image. Routinely examine whether the current look and feel of your website match your corporate image. Not able to take care of your own business assets, raise questions about the quality of the services or products you are offering. Hence, you want to ensure that you present your business at its best through your website. With a dedicated website maintenance service partner, you receive services such as infrastructure maintenance, performance monitoring, feedback monitoring, quality control, routine management, risk control, and much more. If you need help with maintaining your site, feel free to reach us.